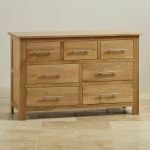 Natural solid oak 3+4 drawer chest of drawers. With the appeal of natural, solid oak, the Rivermead 3+4 chest of drawers will be useful storage around the home. 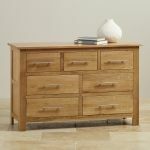 Use as part of a suite of bedroom furniture, or as a standalone piece on the landing or in the hall. 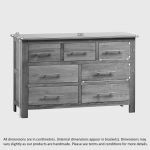 Homes always need plenty of storage, and Rivermead’s modern lines and brushed metal handles will fit with most interior styles. All our furniture is built to last. 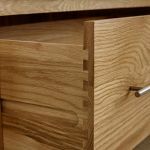 The drawers have dovetail joints, and the whole cabinet is made from oak, even the backs and bases. Combined with Rivermeads’s elegant style, you’ll enjoy this look for many years. 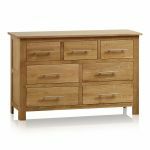 Match this natural oak cabinet with other pieces from the Rivermead range, and put together a cohesive look in your home.